Scaffolding has been the traditional “go to” solution for work at height and difficult to reach environments. Though it is generally considered safe, it’s assembly and disassembly is costly, cumbersome and complex, adding considerable and unnecessary cost to any job. In extreme cases, scaffolding cannot be deployed and the performance of a task is entirely prohibited. Now there is an alternative – Industrial Rope Access. TASC’s Alternative Access Solution​ delivers cost, safety, and production benefits. Our workers can get to and from difficult locations faster, safer, and with less impact on surrounding operations and activities. 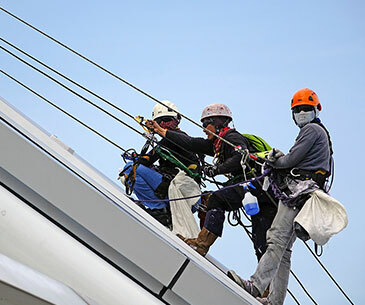 Due to the efficiencies involved, less technicians are needed and the number of hours at height is reduced, leading to a reduction of total “man-at-risk hours” when compared with traditional access methods. One of the areas where TASC’s alternative access solutions stands above is in shutdowns – especially emergency or unplanned outages. Whereas scaffolding crews will require hundreds or thousands of pounds of components transported to location and hauled to height, along with a substantial crew size, TASC can reach most locations with a crew of 3-5 technicians and a pickup truck’s worth of gear. This means that instead of waiting hours, days, or even weeks for scaffold to be built, we can be in position and working to repair the problem almost immediately.